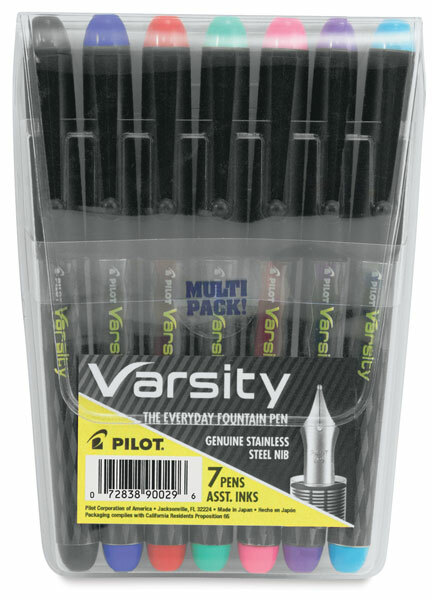 Pilot's Varsity fountain pen combines contemporary design and modern convenience with the smooth writing of a liquid ink fountain pen. 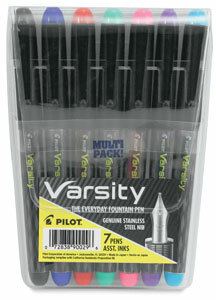 The Varsity is lightweight and disposable without the messy cartridge changes that classic fountain pens are known for. Use it for everyday writing, lettering and calligraphy. The ink supply window on the barrel lets you see how much ink is left. Set of 7 Colors — The set contains 7 colors in a convenient plastic storage pouch. Colors include Black, Blue, Red, Green, Purple, Turquoise, and Pink.